65″ YELLOW CARD (PVCS): Parker Pleasant caught diving in the penalty area. 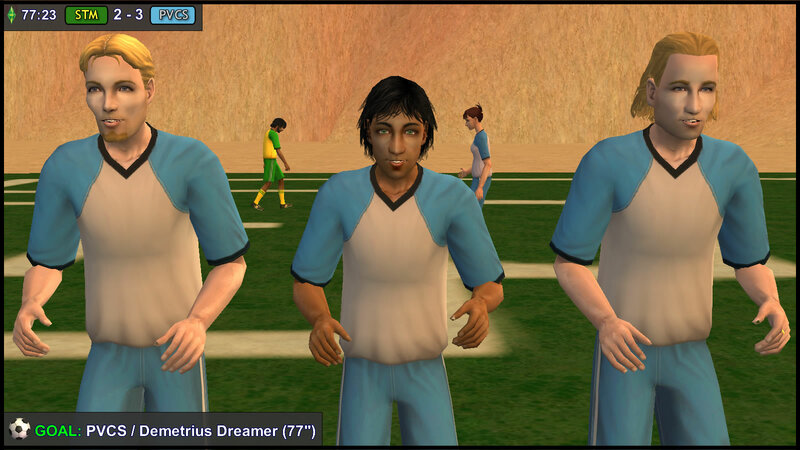 67″ CORNER KICK (PVCS): Taken by Hermia Summerdream. Kelly Summerdream accidentally passed back, and the ball went over the sideline. Regan Capp: Daniel, I can’t take any more risks with Kelly… (yells at the pitch) Hal is the new Free Kick taker! Hal Capp: OK, Aunt Regan! Wait! It rebounds back to Newton, who does a bicycle kick from a distance, Simbrahimovic style! Juan Caliente tips it over! Corner kick! Regan Capp motions to Hermia Summerdream, who happened to be nearest to the sideline: “Mark Newton Curious,” she instructs her. bad tackle trips Johnny Smith, who winces terribly as he falls. 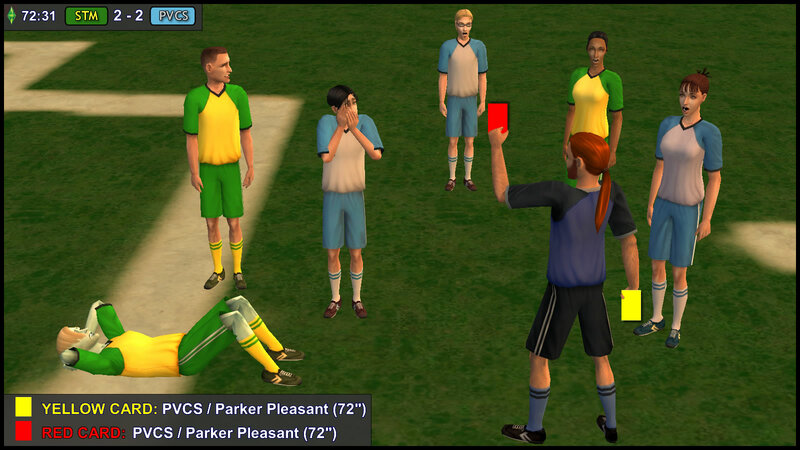 72″ RED CARD (PVCS): Parker Pleasant — He lasted only 12 minutes on the pitch! Team PVCS is down to 10 players too! 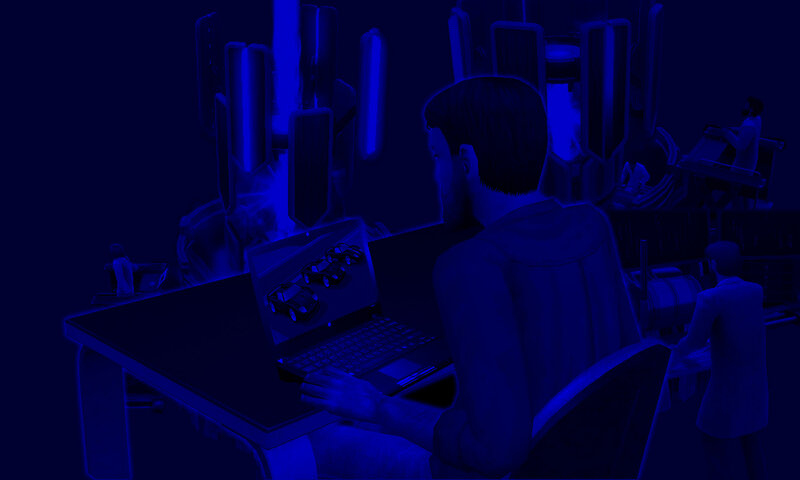 Daniel Pleasant explodes. 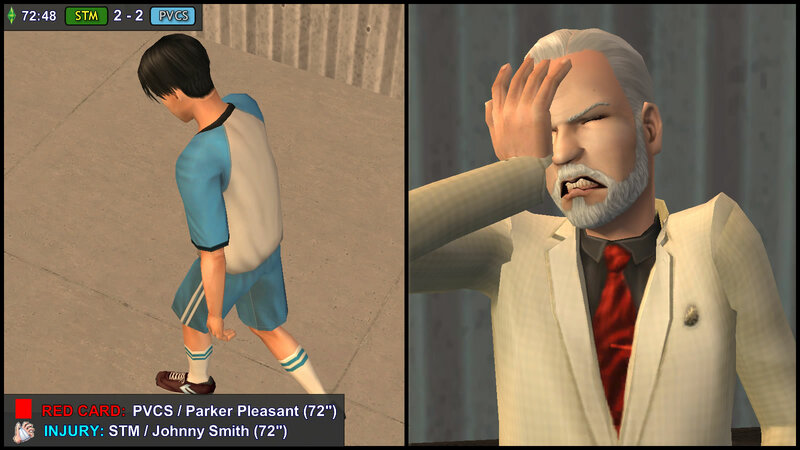 He suddenly realizes his calmness in the previous match is due to none of his kids being outfield. He thinks he might have had a heart attack if Angela and Lilith had been outfield together 20 years ago. 72″ INJURY (STM): Johnny Smith is in great pain. His ankle hurts, but his face hurts more. Tank Grunt remembers how he swore to break Johnny’s nose when they fought as teenagers. But now, he wonders if Johnny’s nose is ok.
74″ Ouch! The ball went smack into Lucy Burb‘s face. 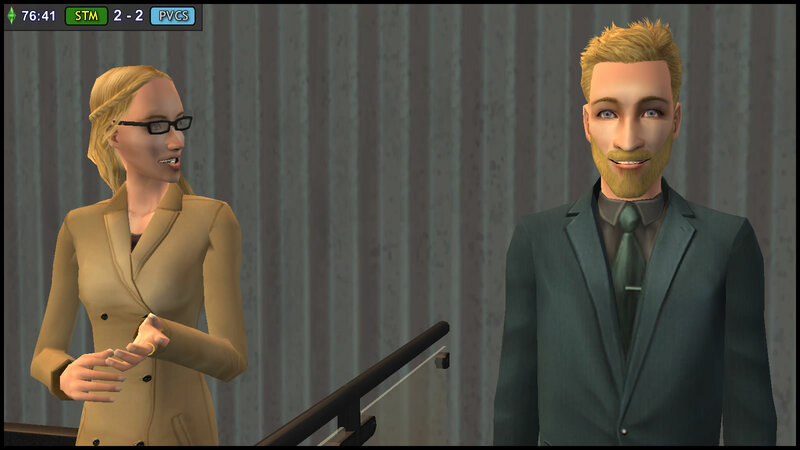 Meanwhile, Juan Caliente is surprised to feel NO “alien vibe” from Summer Smith, even though she was within close range to him. 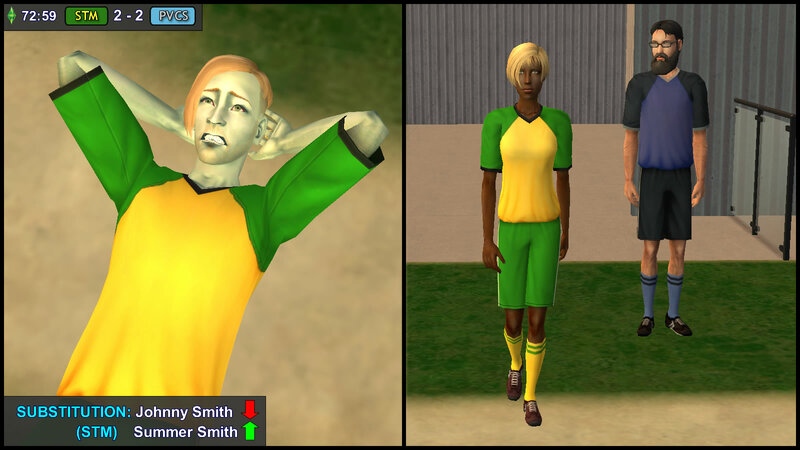 Isn’t she the daughter of half-alien Johnny Smith, but with a human skintone instead? Wait a minute. THAT description fits Juan’s Mom and Aunt perfectly. No wonder Juan never felt the “alien vibe” being emitted from Dina and Nina Caliente. However, Juan felt the “alien vibe” clearly emitted from all the Curious Cousins, Johnny Smith… and Uncle Don. 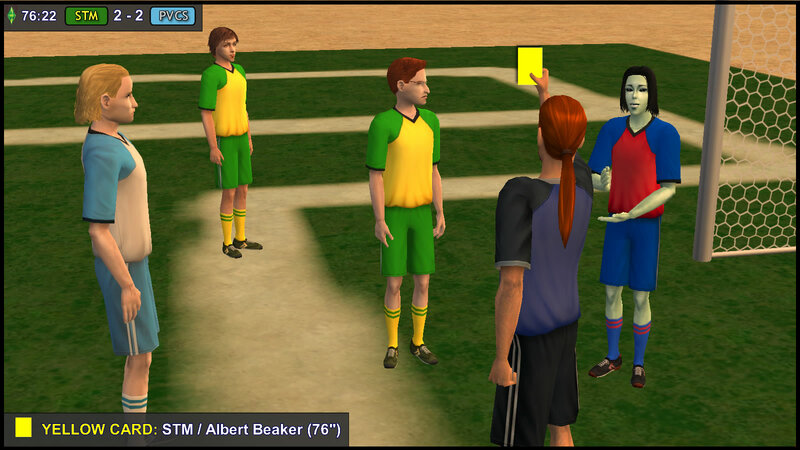 76″ YELLOW CARD (STM): Albert Beaker caught diving in the penalty area. Juan Caliente didn’t have to tell the referee that, as the referee saw it for himself. This causes Albert and Juan to glare at each other again. Kent Monty: Great game so far, Regan! 77″ GOAL (PVCS) 2-3: Demetrius Dreamer – Firstly, the ball ended up with LB7, and she nicely lobs it, so Demetrius Dreamer could score a header! Demetrius Dreamer scores what could be the winning goal for PVCS!! S2P: Wait, why isn’t Lucy cheering? AH: Seems like an unplanned assist. She probably intended to shoot, but ended up lobbing the ball instead… she looks upset with herself. 80″ SHOT OFF TARGET (PVCS): Beau Broke intercepts a pass from Bea Monty, and breaks through the STM defense! He shoots, but puts it too high! Great opportunity. AH: Wait, isn’t he the boyfriend of Lucy Burb? S2P: Yes. Seems Beau is even better than Lucy! Don’t tell her I said that! 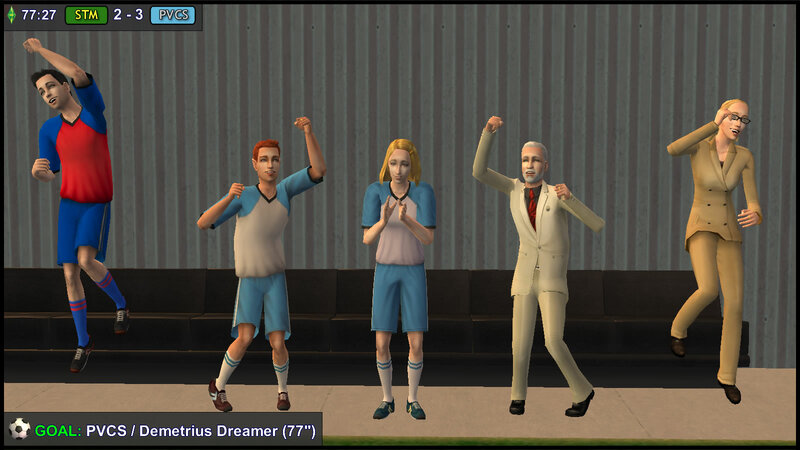 83″ SHOT ON TARGET (PVCS): Demetrius Dreamer for his second? Yeah?? No!!!! Ben Monty with his amazing reflexes! 85″ SHOT OFF TARGET (STM): Albert Beaker gets the pass from Tank Grunt. Albert tries to replicate Vivian Curious’ long-range goal, but it goes wide. 87″ (STM): Goal kick by Ben Monty, which ends up at Vivian Curious. She passes it to Horatio Monty. 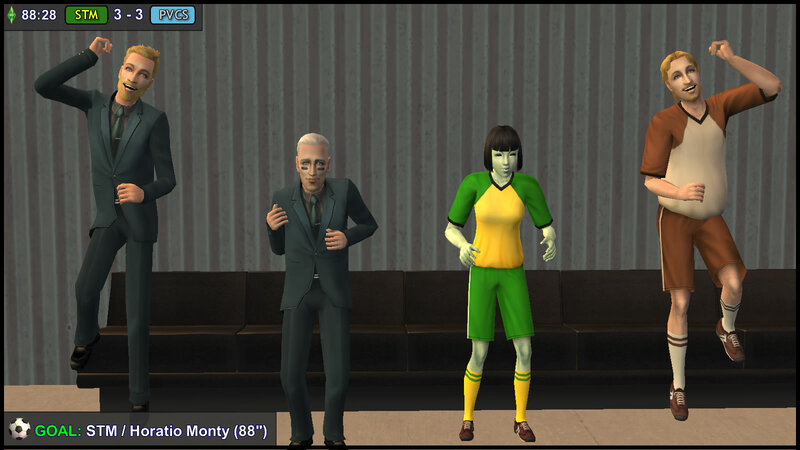 He sprints with the ball, passes it to Bea Monty, who passes it back! Juan Caliente is confused! Open goal! Horatio must not miss this one!!!!! 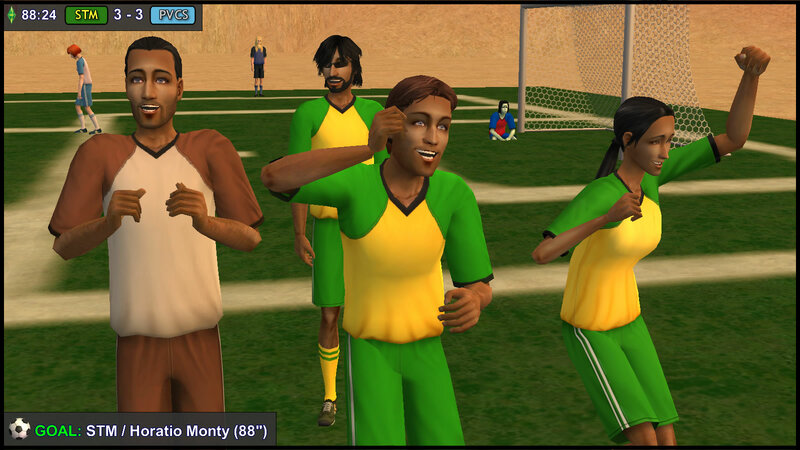 88″ GOAL (STM) 3-3: Horatio Monty – Hahahaha… GOAL!! Horatio just dribbles the ball over the goal line! Impressive! 3-3!!! Tybalt Capp: (to Octavius) Now’s your chance… beat up that Monty loser! 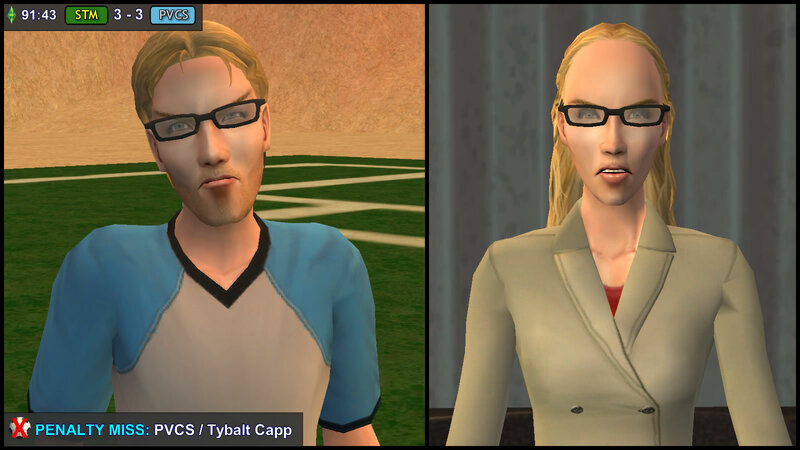 Octavius Capp: (thinking) Are you crazy? 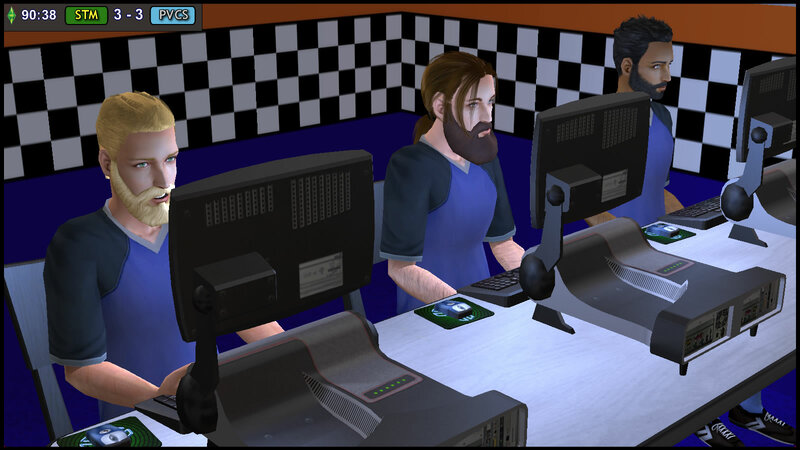 I don’t want to be red-carded! 90″: PVCS CORNER: Juan Caliente tries to be a hero, by coming all the way up to attempt a header. 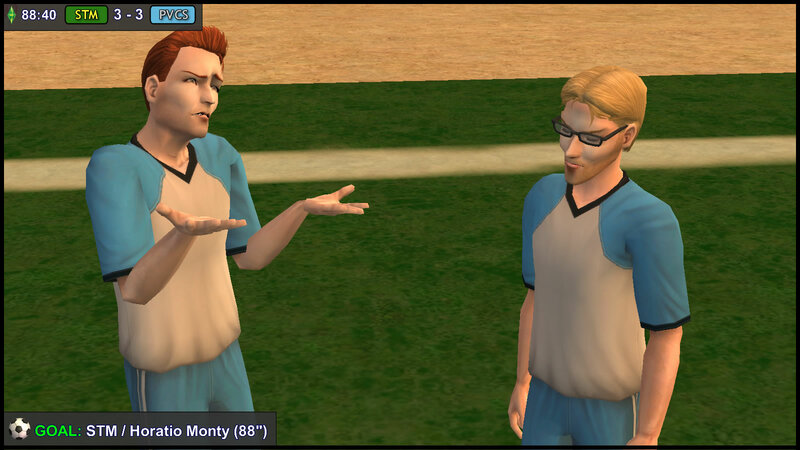 When the ball comes in, he and Albert Beaker have a fair clash, but the ball ends up with Mercutio Monty, who clears it halfway across the field. But Juan is taking his own sweet time to get up. Albert is already up, with his eyes on the referee. The Video Assistant Referees (VAR) are also urging Baptiste to blow the whistle immediately. Referee Baptiste turns around. 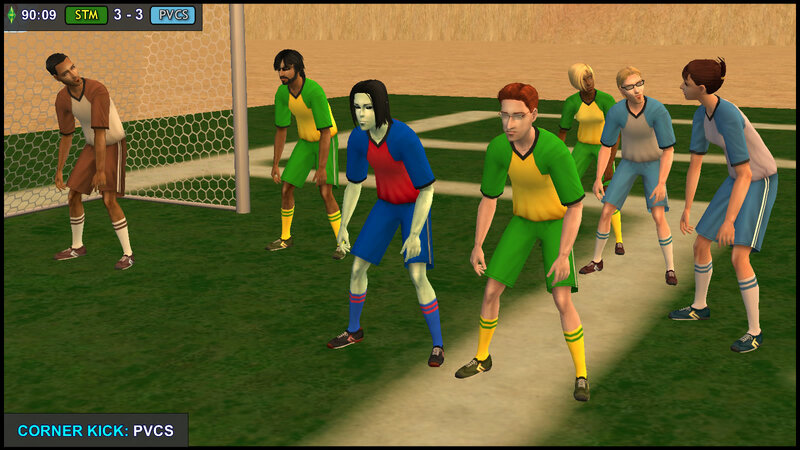 Indeed, the PVCS goalkeeper is on the ground, inside the penalty box, clutching his shoulder in pain. He blows the whistle. Baptiste: (through the earpiece) What did you see, Xu? 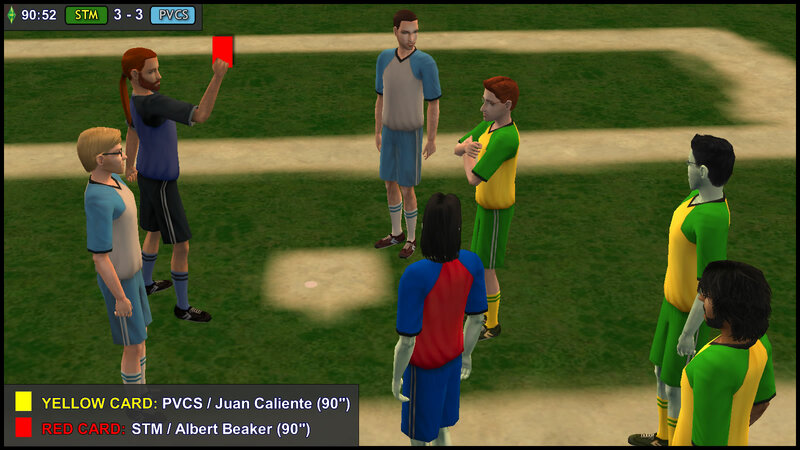 Xu: Albert Beaker bit Juan Caliente in the penalty area. Ivanov: Yes, I saw that too. The PVCS players are saying exactly the same thing as the linesmen and the VAR. The STM players who saw it are too shocked to comment. Juan gets up, and shows the bite marks to the referee. Juan swears, and makes a rude gesture at Albert. 90″ YELLOW CARD (PVCS): Juan Caliente. Rude Gesture and Abusive language. 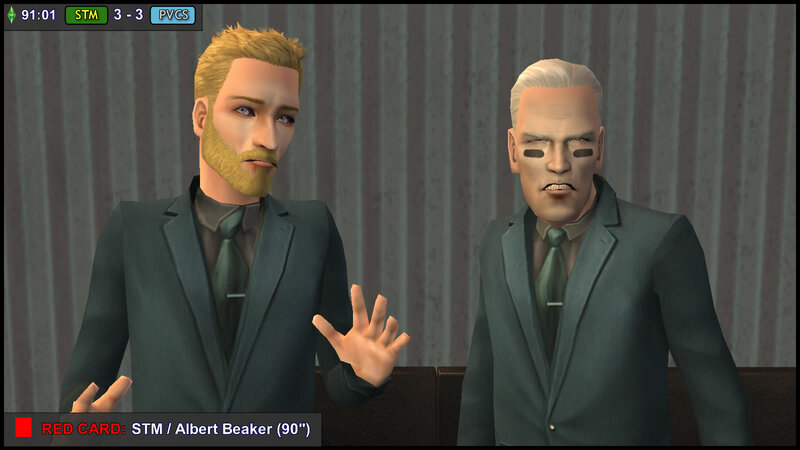 90″ RED CARD (STM): Albert Beaker. Violent Conduct (Biting, Suarez-style) Team STM is down to 9 players! As the foul happened in the penalty box, the Referee awards a second penalty kick to PVCS. Circe Beaker: (ruefully) We should’ve given him less! He takes after both of us too much. Grunt: Fringin’ boolprop. We should’ve subbed off that Beaker imp 25 minutes ago! Kent: Cool it, General. Both our substitutions were forced, anyway. We can’t let Isabel Loner and Johnny Smith continue to limp out there, can we? It’s correct for us to ration our third substitution. 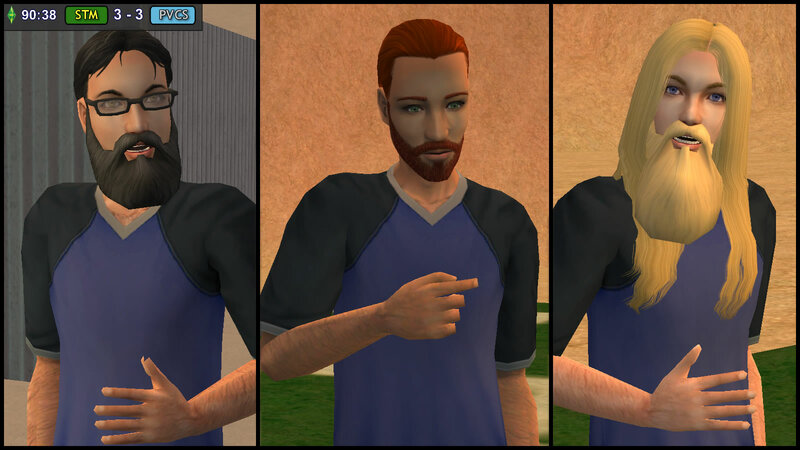 Kent: Grunt, please. You wanna be out here at the final whistle, not in the dressing room. If we survive this penalty, that’s when we’ll use our third sub. 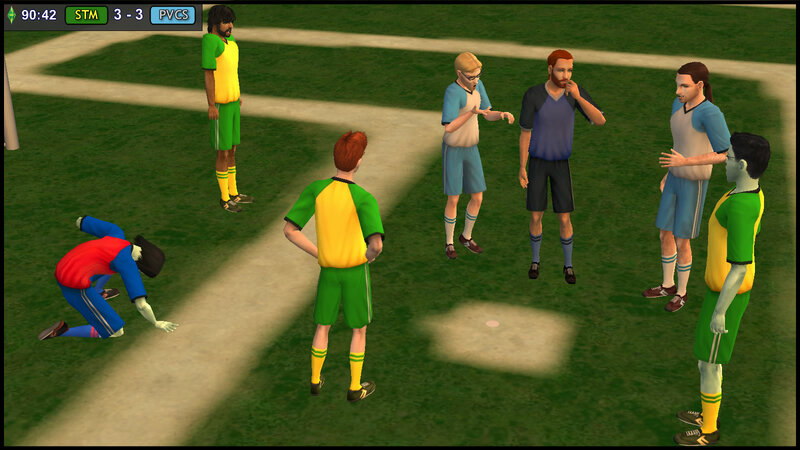 91″: Albert Beaker walks slowly off the pitch, in tears. 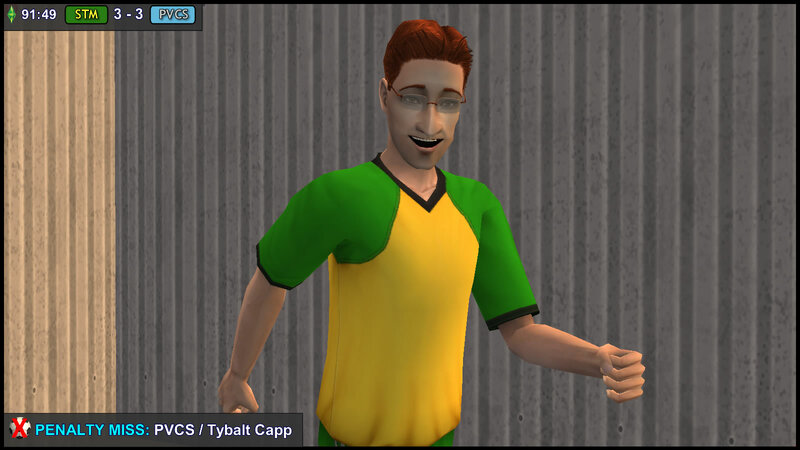 S2P: Looks like Tybalt Capp is preparing to take this penalty. 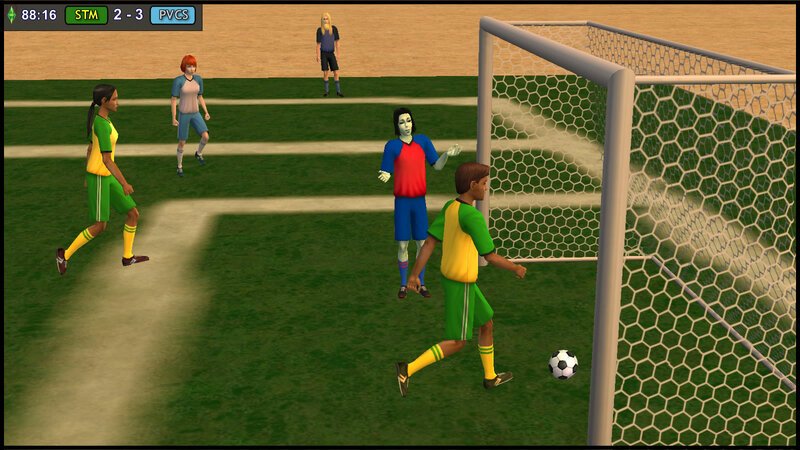 91″ PENALTY KICK (PVCS): Everyone watches Tybalt grimly, especially Regan and Octavius. The ball hits the crossbar, and bounces off the pitch. The PVCS fans are stunned into silence, but the STM supporters break out into cheers. Bea Monty congratulates her goalkeeper brother with a hug. Octavius glares at his mother. Regan looks at him sternly. Tybalt’s pride is completely broken, and bursts into tears. He allows his sister, Hermia, to console him, but brushes aside everyone else. 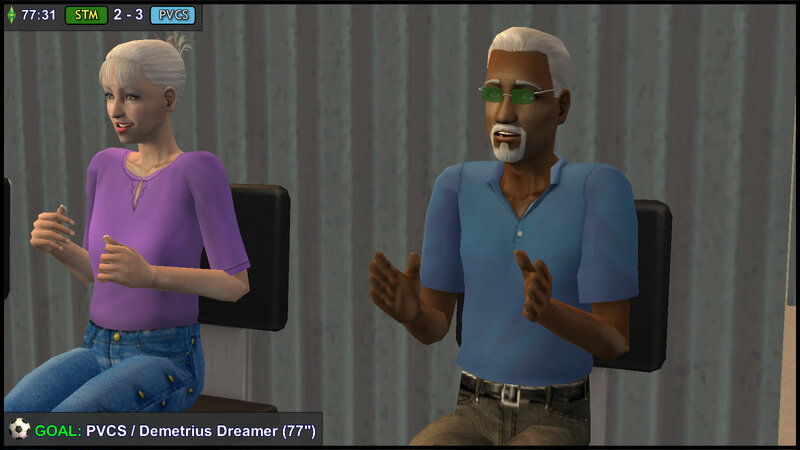 His aspiration meter crashed, and he officially hates Octavius. Albert is halfway through the tunnel, and his mourning suddenly changes into a show of jubilation, before vanishing into the Dressing Room. Claudia Monty: (playfully) Hey Albert, how does alien taste like? Claudia: Let me guess… minty? As they pass each other the sidelines, Zoe says, “Nice bicycle kick, bro.” Newton smiles and nods in acknowledgement. Sim of the Match: Ben Monty, for saving a very high percentage of the shots on target. The whistle may be blown for the end of the 2nd Half, but the post-match drama is NOT over. What mysterious conversations happened in the tunnel during the Half-Time Break? Are there scores that need to be settled?